Can I upload files for a supplier? In LSP.expert, you can upload files (CV, etc.) for each of your suppliers. For each supplier you have in LSP.expert, you can upload files from Dropbox, Google Drive, OneDrive and your computer. In the supplier, you have a Files tab (on the left). 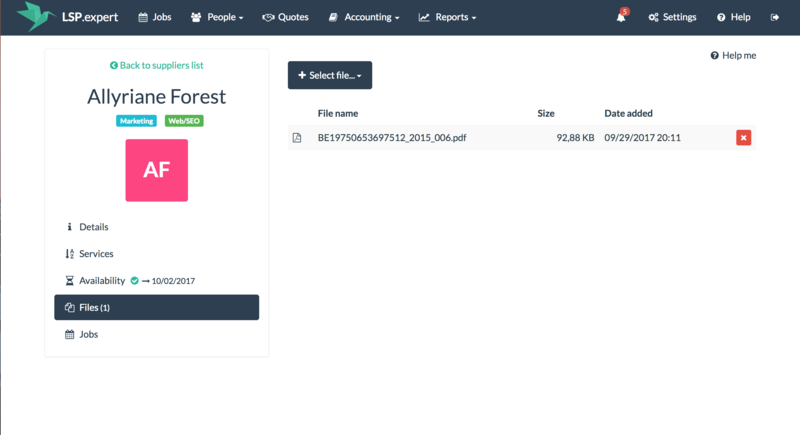 The File Manager allows you to quickly find the files you're looking for, to keep track of all the files (old and new versions) for a supplier and to access these files from anywhere, on any device.